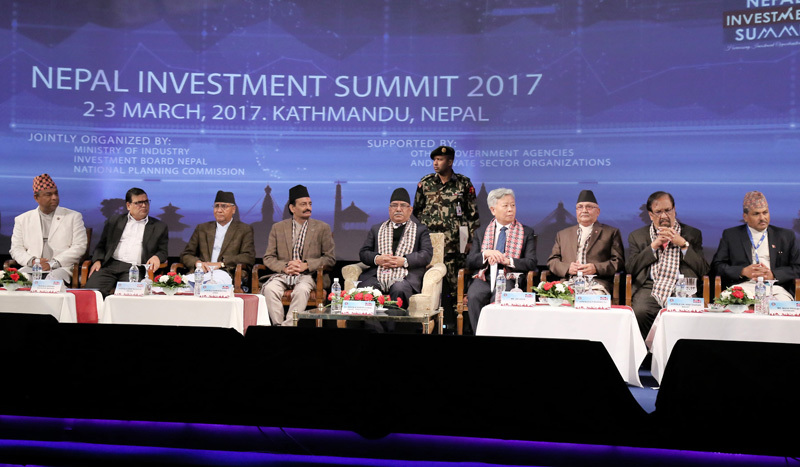 Nepal successfully organized Nepal Investment Summit 2017 to send a clear message to international investors that with the end of the protracted political transition it now wants to utilize foreign investment for its economic prosperity. Nepali officials had an opportunity to draw the attention of international investors at the two-day summit to the country’s huge investment potential. The summit had kicked off with a clear and strong commitment from top leaders of Nepal’s three largest parties—Nepali Congress, CPN-UML and CPN (Maoist Center)—in favor of foreign investment. As one international participant said at the summit, it is next to impossible for leaders of different political parties to share the same platform in his country. At a time when many international investors are complaining about lack of political commitment in Nepal for Foreign Direct Investment (FDI), such common message of our top leaders has not only encouraged global and domestic investors but also sent a positive message to the international community. Letters of Intent (LoI) signed at the event by investors totaled Rs 1,400 billion (US $13.52 billion). It is a testimony of increasing confidence of international community to improving investment climate in Nepal. The overwhelming response from existing and potential investors (mostly foreign ones) has undoubtedly encouraged Nepali officials, private sector and development-loving Nepali people. The Investment Board of Nepal (IBN) and the Ministry of Industry had worked hard to make this event a grand success even in the little time they had. The summit indeed proved to be an epoch-making event in term of positive response from the investor community. The amount of committed investment is far-higher than our national budget and almost two-third of our overall Gross Domestic Product. The unprecedented response of the investor community comes when Nepal is facing huge infrastructure deficit due to its lack of resources and technology. But promising investor response has sent a wave of hope among Nepali people and shown their confidence in investment climate in Nepal, where political stability is being gradually restored with the promulgation of new constitution. The government’s new initiatives at legal and administrative reforms targeting foreign investment are in turn contributing to greater trust of Nepal among international community. Nepal aspires to be an ideal investment destination with a favorable business climate. The country’s strategic location between the world’s two fastest-growing big economies—that together are home to one-third of the global population—is a great opportunity. Strong commitment of Indian Finance Minister Arun Jaitley to help Nepal achieve economic prosperity and the desire shown by AIIB president Jin Liqun to boost infrastructure investment were encouraging. Participating investors were highly encouraged when Jaitely and Jin highlighted, from the same podium, the sectors where Nepal has great investment potential. Such investor response means greater responsibility on government shoulders. The government must create an environment that helps translate investment intent into commitments and commitments into actual investment. Strong follow up is necessary to secure the investments. Realizing the need of such a follow up, the government is forming an overall coordinating committee under the Minister for Industry. This committee should be active in not only following up with investors but also in reviewing legal and administrative obstacles to FDI. Basically, private investment is the key to overall national development given our government’s limited capital, human resources and technology. Even Nepal’s private sector will not be able to fill resources and technology gaps for infrastructure development, without more FDI. In the 14th plan, the government has planned to invest over Rs 2,400 billion in next three years, with contribution of 39.4 percent from the public sector, 54.7 percent from the private sector and 5.9 percent from the cooperative sector to achieve an annual growth of 7.2 percent. Key sectors of investment such as energy, road, rail, tourism, agriculture and mining call for massive investment, especially from private sector, to achieve our development targets. For example, as the Nepal Power Investment Summit 2016 concluded, Nepal needs an investment worth US $20 billion to generate 10,000 MW in ten years. It needs another US $5 billion to build all the necessary high-voltage transmission lines by 2035. By this time Nepal, on its own, is expected to consume more than 10,000 MW. The limited resources in the country won’t be able to deliver all this. We thus need more FDI to plug the gaps between our infrastructure needs and the available capital and technology. But average annual FDI into Nepal over the past eight years was a meager US $50 million, which translates into per capita FDI of less than US $2. In contrast, our neighbors Bangladesh and Sri Lanka command per capita FDI of US $10 and $36 respectively. Existing level of per capita inflow is insufficient to achieve Nepal’s desired development goals. As National Planning Commission (NPC), the government’s apex policy-making body, estimates, Nepal needs 9 percent annual growth to graduate from Least Developed Country to a Developing Country status by 2022. To achieve the required growth, we need an annual investment of around US $7 billion. For the upgrade of Nepal into a middle-income country by 2030, our economy needs a massive injection of private investment. However, as things stand, the share of private sector is just under one percent of total infrastructure investment. As IMF puts it, $1 investment in infrastructure yields $3 additional income. However, infrastructure investment in Nepal is less than 3 percent of GDP, while FDI is less than 0.1 percent of GDP. India and China are spending 12 percent and 11 percent of their GDP in infrastructure respectively to achieve far higher economic growth. So, in order to harness its investment potential, Nepal has to ensure policy stability and legal and administrative reforms to simplify the process of doing business. Better coordination among government agencies, continued promotion of Nepal’s investment potential, simplification of land acquisition and environment clearance for big projects and establishment of one-window system for investor services are vital in order to attract more investment. 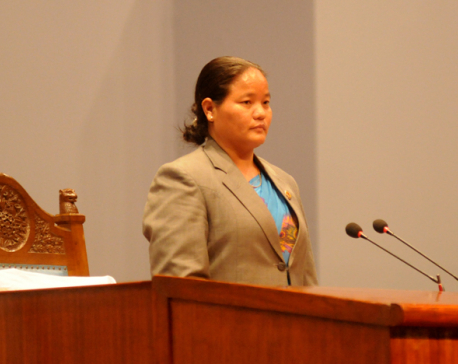 For it is also clear that we cannot solely rely on foreign investors for the desired level of investment.